An examble of hollow heart disorder in watermelons. 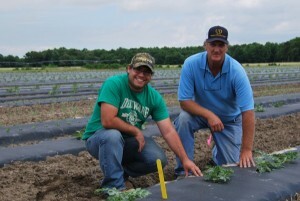 Graduate student Donald Seifrit and Gordon Johnson. Looking for a solution, Johnson turned to discussions by watermelon researchers that the disorder could be linked to pollination. In 2010, he conducted a study in which he created situations to limit the pollen available to watermelons to quantify if that would have an effect. “Basically, I designed a study where watermelons would be a longer or shorter distance from a pollen source,” said Johnson. 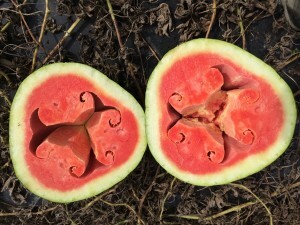 Johnson conducted the study on seedless watermelons – although hollow heart also occurs in seeded watermelons – because the bulk of the watermelon industry grows seedless varieties. 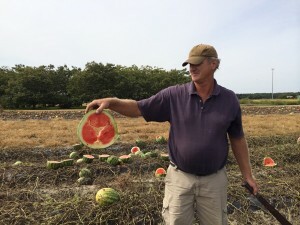 The production of seedless watermelons is a bit of a complicated system because the watermelon produces a seedless fruit but requires a pollinizer plant, which is the seeded type. Generally growers plant in a one-to-three ratio, with one seeded watermelon that produces viable pollen for every three seedless watermelons that do not produce viable pollen. “You have to get the pollen transferred from the pollinizer to the seedless watermelon for fruit set,” Johnson said. “I set up some experiments to put seeded types at varying distances from the seedless, and I found that when you got further from a pollen source (wider ratio of pollinizer to seedless), you got more hollow heart.” After the initial study, Johnson started repeating the experiments, continuing to put the pollen sources at varying distances or ratios. “Each time I would find that when I got further away (wider ratio), I would have a higher incidence of hollow heart,” he said. Johnson also found that the flesh density of a watermelon variety plays a role in how it is affected by hollow heart. “When we looked at the more dense varieties versus the less dense varieties, the less dense varieties had more hollow heart, particularly when you moved away from a pollen source,” said Johnson. To learn more about how density plays a role in watermelons affected by hollow heart, Johnson is looking at the initial number of cells that are being produced in the plant. A slice of watermelon that has hollow heart disorder.